* We cannot accept graduate students who are enrolled in the first semester of the Master’s program after finishing the Bachelor’s program. * Considering the current lack of course capacity for exchange students, CBA has decided that from Fall 2019’s admission, they will strictly control the number of accepted exchange students to CBA to provide quality education and better administrative support. In this regard, it is more likely than the past that students who apply for CBA might get rejected during the screening procedure. Applicants who want to study in the discipline of Pharmacy, Dentistry, Nursing, Music, and MBA must, in advance, be advised of the eligibility by SNU coordinators. SCHOOL OF DENTISTRY is open ONLY to graduate students currently enrolled in a master program at School of Dentistry or equivalent at their home university. The student exchange program is NOT available at the undergraduate level. IMPORTANT NOTES :Exchange program candidates can complete the application by online submission. *In order to start the on-line application, exchange candidates must be officially nominated by their home institution by e-mail. 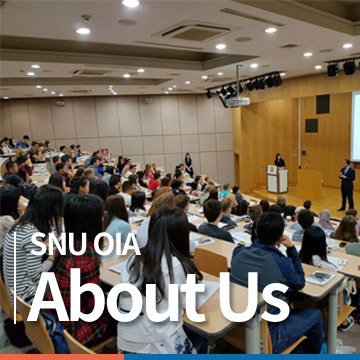 The nominated students will receive detailed information on how to log in and apply online by the designated SNU coordinator. Exchange program candidates should upload the scanned copies of the documents below to the application system. - Exchange program candidates should submit the sealed letter to their exchange coordinator. The OIA receives applications and reviews that all application requirements have been met. The application packet is then forwarded to the screening committee of each college for assessment. Not every candidate nominated will be successful; some may fail to be accepted if the requirements do not meet the committee’s expectation. When the acceptance is confirmed, the OIA notifies the result via email. The OIA is not responsible for the selection process and its results since the decision is made by each college. The acceptance package will include Certificate of Admission (not to Korean national), Letter of Acceptance, and other necessary information. Contact persons for faculty or department-level agreements : Please contact the designated coordinator of each SNU faculty/department.